In the Four of Swords the Knight has armor and so we must assume that he has been engaged in a battle of some sort and has needed to protect himself. has found a place of sanctuary where he feels safe from threat of attack. Over the Knight’s head are hanging three swords. These are the Swords we encountered in the Three of Swords were pierced through the heart bringing pain, hurt, trauma and stress. However, this Knight has been on the front line too long and through injury or just pure exhaustion no longer has the energy for the fight. The Knight was tired and wounded; he has retreated from the battle scene and sought sanctuary in a spiritual place such as a church or monastery. It is here and during this time that he will attempt to heal his wounds. When we speak of the wounds inflicted by the Three Swords they may be physical, emotional or psychological. The tomb can be a hospital or an intensive care unit. This is temporary and a full recovery can be expected. 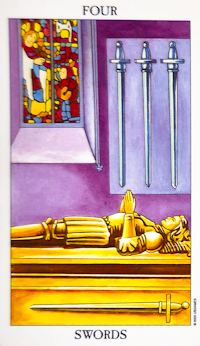 The Four of Swords is a Knight was born hyper and driven by compulsiveness – now he needs to understand that just because he lies there as still as stone – it does not mean that internally he is not active. On the contrary, he will discover that when he does lie down or step down he will gain perspective and balance. This born troublemaker must ask himself what the real problem is and once identified must concentrate his focus on making it his number one priority. In his meditative state understanding will filter through from his subconscious to his conscious. Domestic violence. There is a negative pattern and cycle operating which must be broken. Release from a relationship that felt like a prison. Distance from a violent-abusive relationship. The Four of Swords can represent counseling as a profession or teaching meditation. Your job however, may involve you working with the dead or dying. Working in the funeral business. Mental Exhaustion, Stress, Overwhelmed, Retreat, Time-Out, Healing, Solitude, Sleeping on your Problems, Coming to Terms, Spiritual Counseling, Spiritual Support, Keeping Faith, Confinement, Sanctuary.